WHO MAKES FOETUS LAUGH AND WEEP? Who Created the Universe and Why ? The Levels of Prayer - What Level are You At? This verse contains a very nice scientific indication about the lately-discovered fact that foetus has facial expressions while he is in his mother's womb, without being taught to do so. The miracle of man creation reveals itself in the stages of foetal development which is described by the holy Quran and begins with the creation of germ cells in his parents, then when the sperm meets the ovum fertilizing it and they form the zygote (Nutfa Amshaj) which then becomes a leech-like clot (Alaqah) then chewed-like lump of flesh (Mudgha) which turns into bones covered with flesh, then at the decisive moment this foetus is converted from just some growing cells into another creature full of life and moves in his mother's womb and his facial expressions appears clearly. As after this large technological revolution which occurred lately in scanning embryos, we can now see embryos smiling and crying in their mothers' wombs before they see light on earth. 3D ultrasound is a medical ultrasound technique, often used during pregnancy, providing three dimensional images of the foetus. 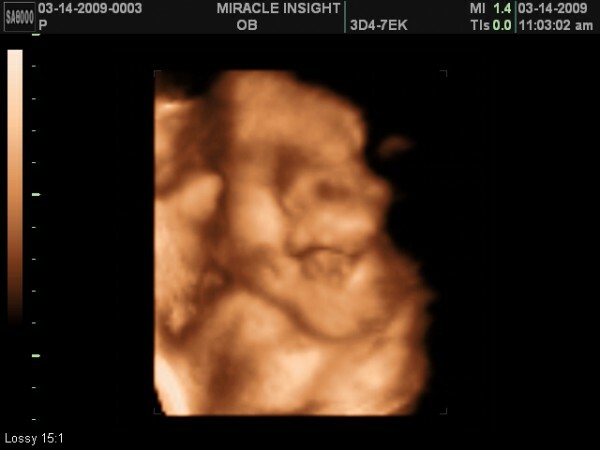 Often these images are captured rapidly and animated to produce a "4D ultrasound". There are several different scanning modes in medical and obstetric ultrasound. The standard common obstetric diagnostic mode is 2D scanning. In 3D foetal scanning, however, instead of the sound waves being sent straight down and reflected back, they are sent at different angles. The returning echoes are processed by a sophisticated computer program resulting in a reconstructed three dimensional volume image of foetus's surface or internal organs; in much the same way as a CT scan machine constructs a CT scan image from multiple x-rays. 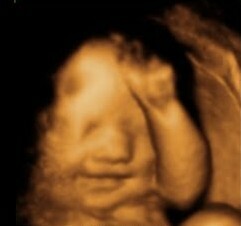 3D ultrasounds allow one to see width, height and depth of images in much the same way as 3D movies but no movement is shown. 4D ultrasounds involve the addition of movement by stringing together frames of 3D ultrasounds in quick succession. 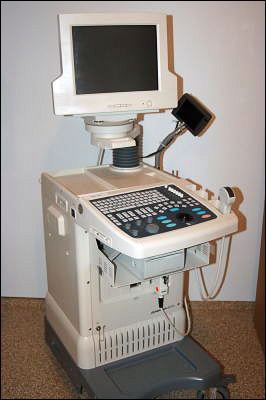 3D ultrasound was first developed by Olaf von Ramm and Stephen Smith at Duke University in 1987. Clinical use of this technology is an area of intense research activity especially in fetal anomaly scanning but there are also popular uses that have been shown to improve fetal-maternal bonding. 4D baby scans are similar to 3D scans except that they show fetal movement as shown in the video clip. 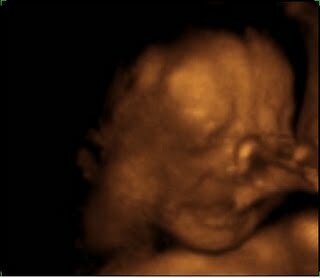 Pioneering scanning techniques have produced astonishing images from inside the womb which show babies apparently smiling and crying. Up to now, doctors did not think infants made such expressions until after birth and believed they learned to smile by copying their mother. Babies do not normally smile after birth until they are about six weeks old. Scientists are not the only who were astonished by these picture but normal people were more astonished. These pictures truly excite in the human soul a state of matchless admiration to Allah's creation. And they trigger the emotions of mercy of parents and the emotions of delight when you see the foetus smiles and the emotions of compassion when you see the foetus cries. And at these emotions, an essential question must be asked, if the foetus is still in his mother's womb and it did not see the light yet, it did not see its mother cry or smile, then who taught this foetus to cry and who taught it to smile? This question is asked even by scientists, Professor Stuart Campbell says : "What's behind the smile? Of course, I can't say, but the corners turn up and the cheeks bulge ... I think it must be some indication of contentment in a stress-free environment." But the answer comes from the holy Quran as Allah says "And that He it is who maketh laugh, and maketh weep," (Quran 53:43). Allah is one who makes embryos smile and it is the one who makes them weep. The advance in science does not only coincide with Quran, but also the holy Quran answers the questions that confuse scientists. This verse is a strong indication to all people that the one gives us the ability to laugh and cry is Allah (SWT). But if we can think of our ability to laugh is favour from God to us, how could our ability to cry be also a favour from God? If we think in a certain moment of our life, we will find that the greatest blessing of Allah upon us is crying……. Yes, it is the first moment in our life, the moment at which we arrive to this earth and without crying at this moment our life ends. Smiles, relief, congratulations and applause do not start when a child is born – they start when it cries. Without crying, the room becomes increasingly silent and the mood increasingly apprehensive; and for good reason – crying is a very positive sign of a new, healthy life. Many factors and complex interactions go into the production of the sound that announces joyful, healthy childbirth. Why the baby should cry? 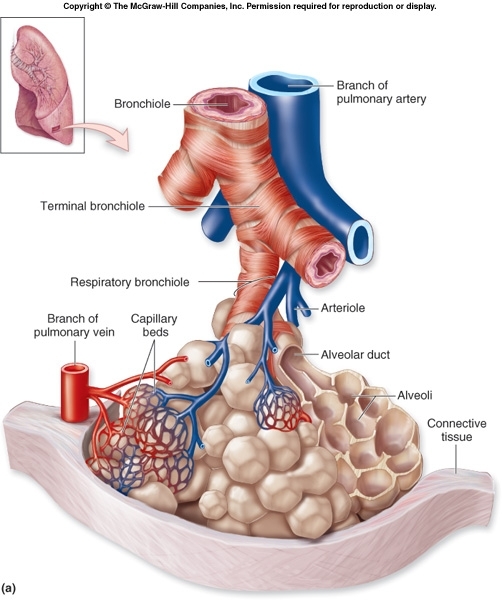 The oxygen exchange in the lungs takes place across the membranes of small balloon-like structures called alveoli attached to the branches of the bronchial passages. These alveoli inflate and deflate with inhalation and exhalation. Everyone knows that it is much more difficult to blow up a balloon for the first time. Why is that? For one thing, the applied pressure does not create much tension in the walls of a small balloon to start the stretching process necessary for inflation. According to Laplace's law, the wall tension will be twice as large for a balloon of twice the radius. If it takes a certain applied pressure to overcome the elasticity of the large balloon and cause it to expand further, it will take twice as much pressure to start to expand the smaller balloon. All this makes it difficult for the baby to take its first breath -- all the balloons are small! The alveoli of the lungs are collapsed in the fetus and must be inflated in the process of inhalation. Thus the traditional spank on the bottom of the newborn to make him/her mad enough to make the effort for the first breath. Further difficulties are encountered by premature infants because the surfactant fluid which coats the alveoli to give them the appropriate wall tensions is formed in the later stages of pregnancy. Until that point, the alveoli are coated with fluid which has essentially the surface tension of water, much higher than that of the normal surfactant.